In these Jungle Doctor Picture Fables you'll meet some mischievous monkeys, a wise giraffe, a grumpy hippo and many other creatures. As you read about their adventures in the jungle, you'll discover that the lessons they learn can help you to understand our world and to know God better too. Paul White (1910-1992) was an Australian missionary doctor. While he was in Africa, he met new friends who taught him all about animal stories and how fables can help to explain the Christian life. This box set contains eight classic Jungle Doctor stories for you to enjoy. 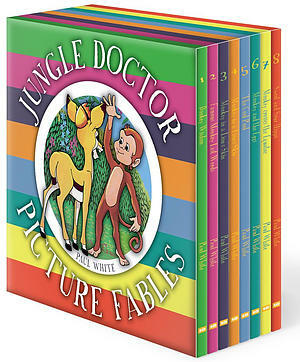 Jungle Doctor Picture Fables Box Set by Paul White was published by 10 Publishing in July 2017 and is our 29860th best seller. The ISBN for Jungle Doctor Picture Fables Box Set is 9781911272328. Be the first to review Jungle Doctor Picture Fables Box Set! Got a question? No problem! Just click here to ask us about Jungle Doctor Picture Fables Box Set.